The Princess & The Geek: Just the kick in the bum I need. Just the kick in the bum I need. Got the results back from my blood tests. I've been diagnosed with PCOS, but I had some idea it was coming so it wasn't a big shock, well not yet anyway. Like Liz (my doctor) said, it can be fixed by losing weight, and not huge amounts, even losing 5 kilos can do it, and since my periods are regular, the PCOS is not as bad as it can be. It does scare me when I read that PCOS can lead to infetility, but like I mentioned, my period are regular, so Liz thinks I'll be fine. I have an ultrasound next Monday just to double check. So there is my incentive to lose weight! I was weighed at the doctors surgery and I was a lot lighter than the scales at home say, and I have an appointment in one month for another weigh it, and that's it. NO WEIGHING myself at home! Liz also prescribed me to Duromine, which is a drug to help me lose weight, as far as I know, it's a hunger surpressant. The girl at the Pharmacy said it was a life saver to her. I'm hoping it will be for me too. And for $100 for one months worth... it better! I'm feeling surprising calm and content about everything. I love Liz, she is so awesome, we spent most of today's appointment talking about the book I was reading in the waiting room (Six Sacred Stones by Matthew Reilly). It starts tomorrow. Be Ready. In other news, you know how I was chosen to be on the jury of an awful case, well yesterday I got a call from the "Sheriffs Department" (yes apparently we have one) saying the the case had been dismissed so I didn't need to come back. HELL YEAH! But Boss had already done the roster, so now I have 4 days off in a row and will only work 26 hours next fortnight :( Managed to score some extra shifts from my sister, but other than that, it's going to be a quiet week, prefect for trying to get into walking everyday again. 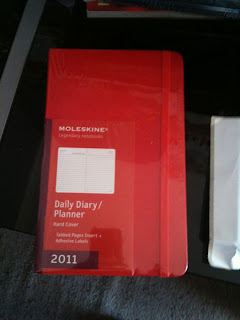 Yesterday I got my 2011 Red Moleskine Daily Planner in the mail. So very excited =D I took it out of the plastic to have a look, but am not going to write in it yet. Yes I know 2011 is still a long way away, but I don't care.... it was a $39.95 diary for $19.95.... I'm not missing out on that. Ahah, lordy. We are alike! I was diagnosed with PCOS 2 years ago, though mine is really bad. I was told I have like a 60% chance I won't fall pregnant naturally, and then a 80% chance I wouldn't carry full term. Turns out I can fall pregnant, but I had a miscarriage after only 2 weeks. My cousin also has it, as has two wonderful healthy children! It's good that your's isn't bad, and that you've taken the initiative to lose weight! I never had a natural period, if I'm not on the pill, I don't get it, at all. So, i'm here if you ever need to talk! *pets your moleskine* I'm hoping to order mine from the site, I just need to wait until a time I have the money! My sister has really bad PCOS. I also have it but mine is very, very mild. Good luck with the weight loss. Mine has come to a standstill yet again. I was going to walk everyday... it lasted for about a week. I am so slack! I love your new moleskin, I have always wanted a moleskin, where did you get yours from? @ Natalie. Thank you so much for your support. It seems that every women has it nowadays.